The UC Davis EV Explorer will help you determine if a plug-in vehicle is right for you. The website is designed to help people compare up to 4 different vehicles, including gasoline and plug-in electric vehicles, side by side on an energy cost basis. Just put in your destination and frequency of travel and the yearly costs will instantly appear for four common vehicles. You can specify your charger access to get an accurate cost for public charger use. The website is part of a California Energy Commission project designed to give tools to planning organizations for electric vehicles. When we interviewed planning organizations, they needed not only planning tools for their own modelers, but for their constituents to make informed decisions. Hence, the EV explorer was born. Please read the Frequently Asked Questions below if you have any questions about the inputs and the functions of the website. Even though it was designed for California, it can work anywhere in the world as long as vehicles are similar to one of the over 34,000 in the fueleconomy.gov database and you can convert from miles to kilometers and gallons to liters. Full unit conversion will have to wait for version 2.0. If you do have any comments, feel free to leave them in the form found in the instructions. We’d like to acknowledge different groups which helped make this website possible. I want to export data, how do I do this? We’ll improve this functionality in the future, but for now to export your data, click the text “Annual Vehicle Energy Costs”. A popup will give you results in tab delimited format to paste into excel or other worksheet program. You must export data before defining a new trip. My MPG or battery range is different from the EPA estimate. How do I change it? First and foremost, MPG and range depend on many factors including your speed, temperature, wind, city driving, and highway driving. Since there are so many factors outside of our control, we decided to let the consumer decide how to come up with the combined number to represent MPG. In the Car Manager, put in revised estimates for MPG and range categories. We use the combined MPG that fueleconomy.gov provides. You’ll have to go back to fueleconomy.gov and see what highway or city MPG is and adjust up or down based on your ratio of highway vs city driving. There are two models of Leaf. One that takes 8 hours (3.3kW version) and one that takes 4 (6.6kW version). There is only one entry in the fueleconomy.gov database which lists 8 hours. You must manually change the charging time in the Car Manager to 4 hours to explore with a new Leaf at 6.6kW. This difference in charging time is meaningful if you are not parked in a location long enough to charge to full on 3.3kW. Twice as much energy will go into the car at 6.6kW in the same period. How do you calculate how much it costs to charge at a destination? If the dropdown has $/hr selected, then the cost is determined by the amount of time the car is parked while drawing energy. If the car is parked longer than it takes to get a full charge, then the website rounds up in time. For example, if the parking duration is 8 hours and the car is determined to draw power for 2.5 hours, 3 hours is charged to the customer. The assumption is that the customer will move the car after it is done charging to avoid getting charged for 8 hours. How do you determine if the car charges at a destination? When you set the “Charger at Destination” dropdown to yes, you are assumed to charge even if you don’t need to. For example, if you have a Leaf and drive 10 miles to a destination, you have sufficient range to return. However, if you have the charger option selected, the website will try to recover those 10 miles at the price you set in the charger options. I want to know how much I will spend if I only plug in only at work and not at home. How do I do this? To simulate this situation, you have to pretend you live at work. Change the home location by clicking the Home tab and either dragging the marker or inputting an address. Put your destination at your home address. If workplace is free you have to put in $0.0001 cents per kWh in the Prices tab since the price at home has to be a little above zero. If you still cannot complete your travel, you can simulate how much home charging you would need by changing the duration of the destination charging and changing the electricity price to your home price per kWh. I want to add a set of trips together and see how much my travel costs for all my travel, not just my commute. This will be v2.0 feature, but in the meantime, you can define each trip separately and export the results to excel. For example, if you go camping 4 times per year, then you can enter an address and define the frequency in the travel/commute settings. To export, click the “Annual Vehicle Energy Costs” text, then copy and paste that trip data into a worksheet program such as excel. Repeat for as many trips as you like. The car I want to compare does not show up in the car manager. Why? The only cars available are those in the fueleconomy.gov database. As soon as a car shows up there, it will show up as a choice in the UC Davis EV Explorer. Some cars have more than one engine or transmission option. Only the automatic with the smaller engine is displayed. You may have to revise the MPG estimates in this case to match your car. CNG doesn’t seem to work as a choice. Is this functional? Sorry, it is not functional yet. It will be a v1.2 feature. Hydrogen will be added, too, provided it is added to the fueleconomy.gov database. I clicked one of the markers and it disappeared. Where did it go? A single click will in essence pick up the marker and drop it behind the location entry box. Just move the map a bit to find your marker or re-enter the address. What are some terms that I need to know? Level I Charger: Charger connected to 120V AC household current. Typically limited to 1.44kW. Onboard Charger: Each PEV has an onboard charger that converts AC energy to DC energy for the battery. This limits how fast a car can charge. PHEVs typically have a 3.3kW or lower charger. BEVs typically have a 6.6kW or higher charger, though some BEVs such as older Leafs have 3.3kW charging. 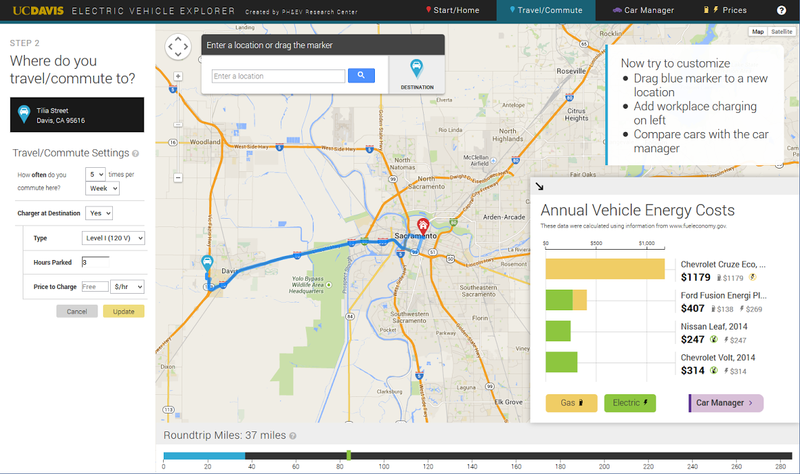 Using the EV Explorer to show potential new car buyers the benefits of an EV. 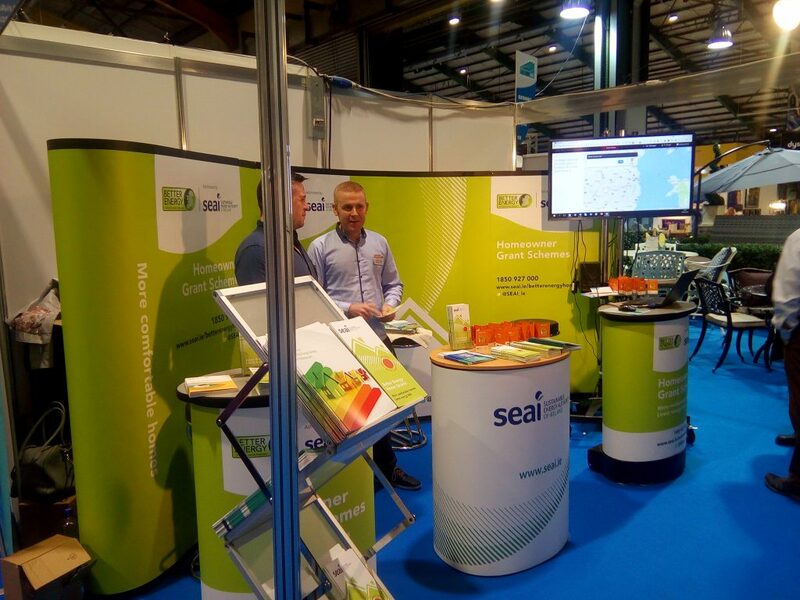 Photo from the Sustainable Energy Authority of Ireland (SEAI). 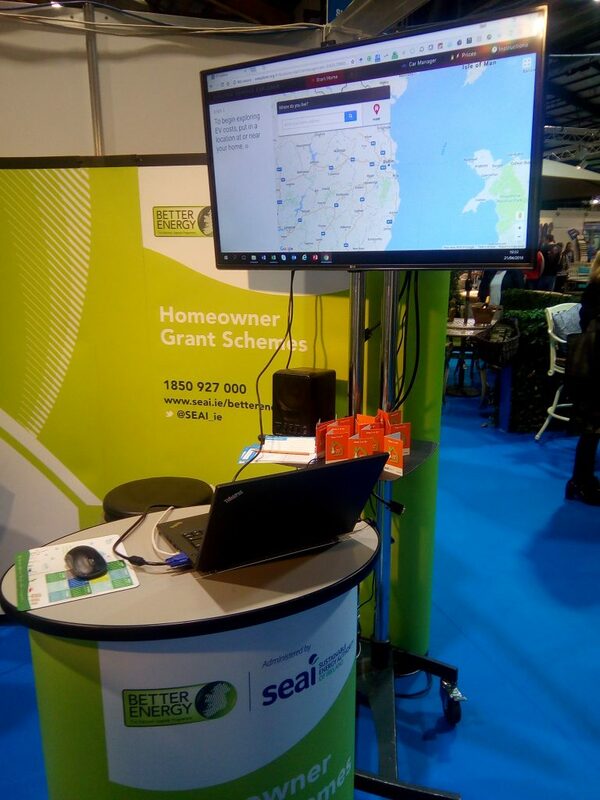 Ideal Homes Exhibition, Dublin, Ireland (2018). 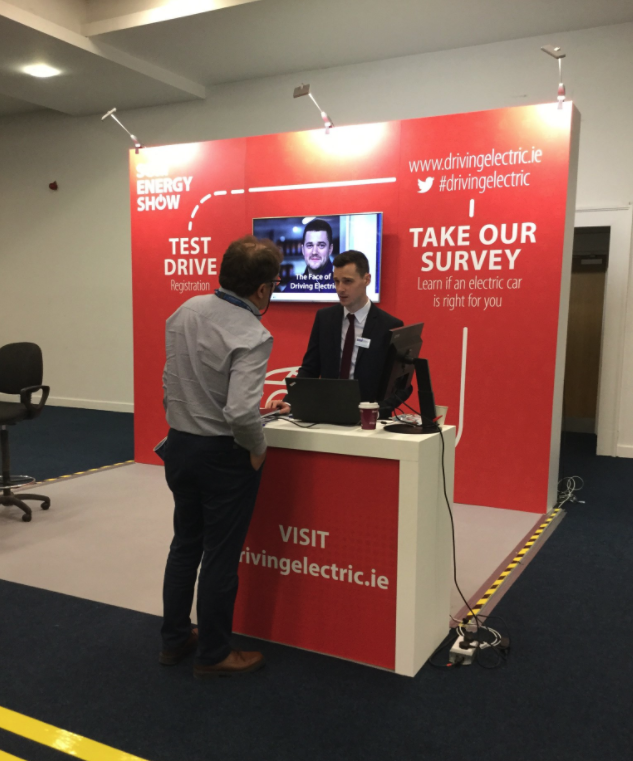 EV Explorer at the SEAI’s Energy Show in Dublin (2018).